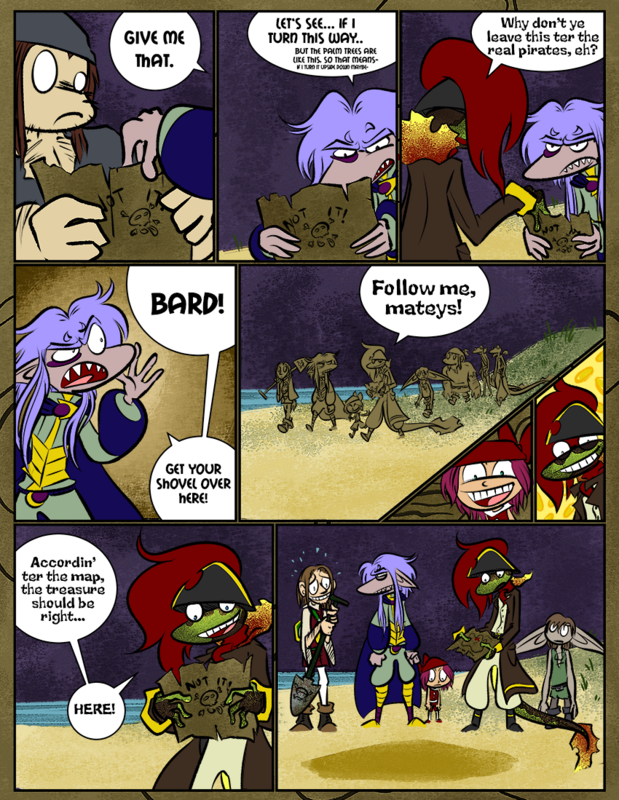 The Fourth » You Shovelly Bard! Our dog is feeling better! Mostly. It was… it was gross. Well, who would have thought Cyril actually dug that spot up? Although him not finding anything is not too surprising. Well, It is good that your dog is getting better. I bet it is good at catch. It seems to get a lot of sick. Everyone has such faith in this bard! It’s so inspiring! OK, it only seems that way because he had a bunch of health problems after we adopted him. But once we worked all those out, he’s been super healthy and energetic all the time for months. And then over the weekend he started barfing out of nowhere and didn’t want to eat anything. He seems back to normal now. Well, here is to hoping that everything is well! It is rather fortunate for him to have a good home too. Pemela’s lookin’ pretty hot there! …huh? Anybody? I’m glad Shadow’s doing better; sick dogs are always really stressful, so, I hope you’re doing fine too. Speaking of dogs, mine’s utterly destroyed that shark toy. My dog is actually Blank. …so…he dug there but just…missed it completely? Bravo, Bard. I kind of wonder what they make clothes for magma-people out of. To be fair, that was his job. He just managed to mess it up. No more comics on the backlog? No… Nonononononono! WHYYYY? I must’ve read them all in one day. </3 This is one of the best stories I have ever read! Oh my god, keep up the good work, love this all! Ah! I’m super happy you like it! Yep, we’ll be keeping it up for years yet. You got on this crazy train relatively early. And, by the way, we’ve been reading your older comments too! We get emails. That was my reaction too when finishing the archives, but it is just as great to see it unfold like this too! Uh oh! Maybe some beat him to that spot? Maybe he dug it up AND KEPT THE TREASURE ALL TO HIMSELF!? Did he really think he could get away with it?! The rascal. Where would he be keeping it anyways! Or: is Cyril just a goof? Find out the obvious on Friday! Yep! He’s back to being an energetic silly lickface. Screw ups of the world, UNITE. Skärva clearly hasn’t played enough Mappy–but Cyril is showing promise at Dig-Dug! They’ve gotten themelves into a hole now; they find trouble by the shovelful! You know, I’m enjoying this arc–I can really dig it. I’m glad to read that your dog is better, although sorry to read that he was ill in the first place. Lorelei is excited about being a pirate! Goldie is excited about treasure. I was actually meaning the yellow spotted background! Well! That’s like, the 7th panel And it’s supposed to be gold coins BUT it does kind of look like the captain suddenly had a fantasy about cheese. Maybe he’s hungry.